The site has had low output for the past few months as I recovered from some oral surgery. This left me unable to play the most lucrative gigs of the year for me but it had to be done when it was instead of the new year. Insurance deductibles, am I right?! Now that I’m back playing again I wanted to find a mouthpiece that was a bit smaller in tip opening so that my transition back into playing and rebuilding my embouchure would go well. For the rebuild process I choose a Yanagisawa hard rubber mouthpiece in a close 5 tip opening. Design: This mouthpiece has all the hallmarks of Japanese manufacturing philosophy. The table, rails and all the milling is clean, crisp, and meticulous. They poured the efforts into making a mouthpiece that feels well manufactured even though it’s mass manufactured. The body is larger than a S-80 or S-90 mouthpiece but smaller than a vintage pickle barrel piece. So if you have a ligature that you prefer that fits a s-80/90 then you may need to hunt a larger one. The beak is medium tall, not as slim as duck bills but not as thick as vintage pieces. It sits well in the mouth and you may not want to use a thick mouthpiece patch. The chamber is large with a round throat and the piece has a slight roll-over baffle. Tone: As you might expect from a medium sized chamber and round throat the tone is reasonably dark but can be pushed to develop edge as you shrink our oral cavity. I’ve been told it has a Gale styled chamber but I can’t be certain. You choice of reed strength and type will make a large difference in the tone. With a Harry Hartman Fiberreed Carbon at Medium Hard strength I can summon a lot of bite. It’s not the edge you get with a high baffle but a buzz you add to get additional definition from a warm piece. I’ve found that I get the best tone for my big band playing from a Forestone Hard reed. Reed Friendliness: I’ve found that once the appropriate reed strength has been found this mouthpiece will play well with any reed. Frederick Hemke #4 reeds gave me a more classical tinge while Legere and Forestone‘s gave me a bright buzz but with depth of tone. 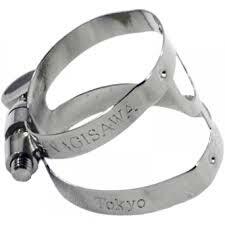 If you can get the Yanagisawa single screw ligature which matches this mouthpiece I highly recommend it. It fits perfectly and the synthetic reeds I play seem to play a bit better with it. Value: This piece is a good value if you need to upgrade from a stock or other cheap plastic mouthpiece but if you already have a piece that fills the same niche as this piece then no it’s not a good value. For example if you already have a S-80/90 or Rousseau and need something for a small combo or big band then I would invest 1/10th as much as this piece and get a Rico Metalite. Final Thoughts: While some might be surprised to hear a player going smaller I suggest that many people have tip openings much bigger than needed. A #5 may be small for some players I think it’s perfect more intermediate to advanced students. I believe this piece to be superior in every way to the Yamaha line of mouthpieces and equal to Vandoren mouthpieces and more consistent that Selmer pieces. Rehearsal Etiquette | How not to be an assh*le!